More than a year ago, I bought a Zeiss AS80/840, a full one, built by Zeiss, not a lens cell only. And since then, I have tried to find some infos, like flyers, brochures, how many exist, dates of production, test reports, etc etc... but I can barely find anything, nada ! How come ? Is it some kind of Voldemort of Refractors and it’s forbidden to say its name ? To find test results, you can google "Zeiss AS-80/840 astro-foren". 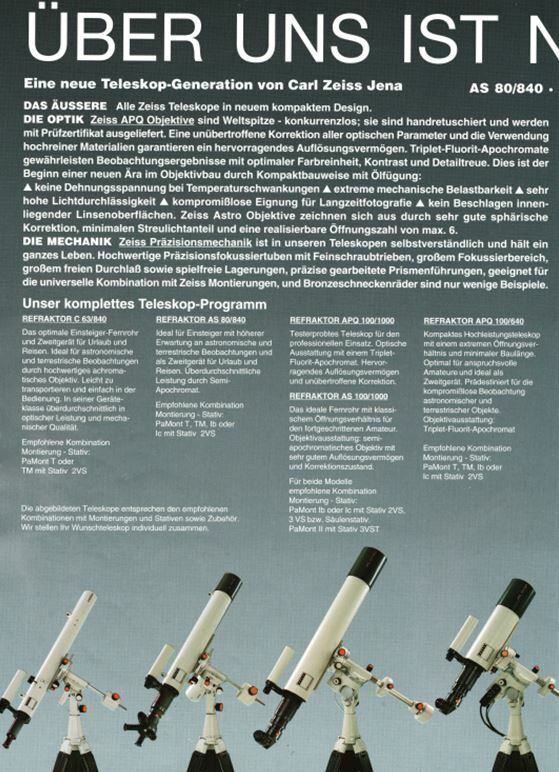 The AS80/840 was part of the "black-&-white" design line of telescopes sold by Zeiss Jena from the early 1990'ies. It was delivered on the (now rare) 2VS tripod that you also have, and optionally mounted on a T/TM or Ib/Ic. Zeiss described the objective as a Semi-Apochromat BK7/KzF2 doublet with a secondary spectrum of 2.8 (which does not quite cut is as a half-apo, compared to the AS80/1200 that has a S2N=2.0, which is right at the upper limit of semi-apo). 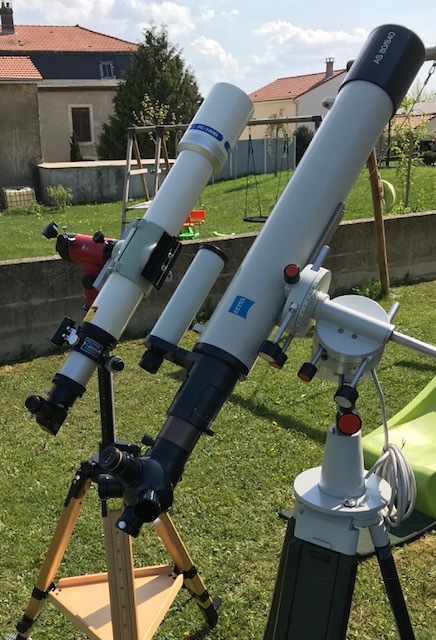 I believe Zeiss sold each AS80/840 with a test-report ("Qualitätsurkunde für Astro-Optik"), -- I have seen one such report with a strehl of 96.7%, but I don't know what was the mean Strehl value or how many of the AS80/840 scopes CZJ produced. Edited by AllanDystrup, 03 May 2018 - 07:20 AM. I had the exact same scope and mount a few decades years ago. Wonderful. With a full set of Zeiss Ortho's. Performance at high magnifications was very good for it's aperture. Did find it quite heavy and a bit bulky for an 80mm scope. Guess some old school design and machining from Zeiss Jena. I vist the Jena factory in May 1990. 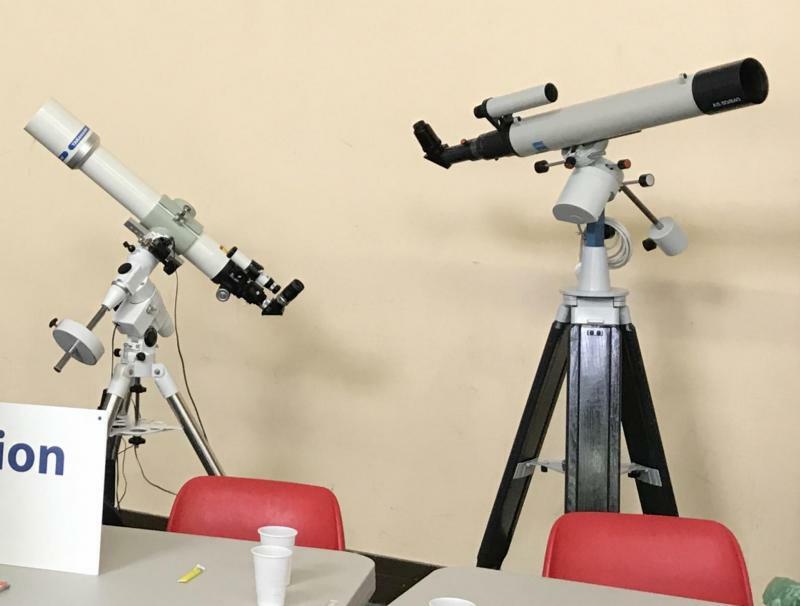 They had just ended a production run of optics for their refractors and Meniskas 180s, but they were very unsure about the future of their astro line. At the moment they were under Treuhand, who were to decide the future of CZJ. A very sad periode in the Jena saga. I use a 3VS which may not be genuinely white, not sure about it, the shiny black paint looks like it was a revamped tripod, but it does not really matter to me. It sure is very stable though. There was a test report published in Sterne und Weltraum 12/1993 (pp. 886-889), Der neue Refraktor AS80/840 von Carl Zeiss Jena, by Elmar Remmert. I can scan pages for you, but please post another picture of AS80/840 here... would like to drool on it some more. I bought it from a French astronomer who used to work for Zeiss France, optics are excellent, but there is like a half millimeter of play in the focuser, some kind of tiny little backlash when going in focus or out focus, so, axial backlash... not important for visual use, and Zeiss have put a thumb screw to tighten un the focuser once in position. Is that the Zeiss SFO 80 Sunfilter? I minimized backlash by regreasing the focuser. There is no means for adjustment. So, you have one too ? Sure wish I had. Tons of praise for your little sweetheart in that SuW article. Author says it is supposed to be fantastic on doubles and planets at high mag with little false color. Wasn't there a thread here with the most beautiful classic? This one would qualify for me. Ticks all right boxes. 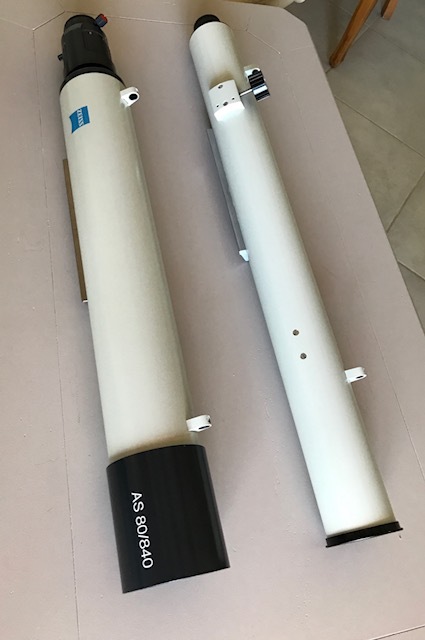 The mount design, the great tripod, the classic color scheme, and the proportion of the tube, not too long and not too small. What a beauty!! Did you manage to shoot some pics when you were visiting the Jena works? Thank you for pictures, it's a beauty. The tube with blue Zeiss logo is the last version produced, my guess around 1995. Check email for SuW test report. It’s an hybrid / mix of two color schemes : TM Mount is the blue version, but tripod is the B&W version. I will try to take a couple of photos next week when the Sun allows it. 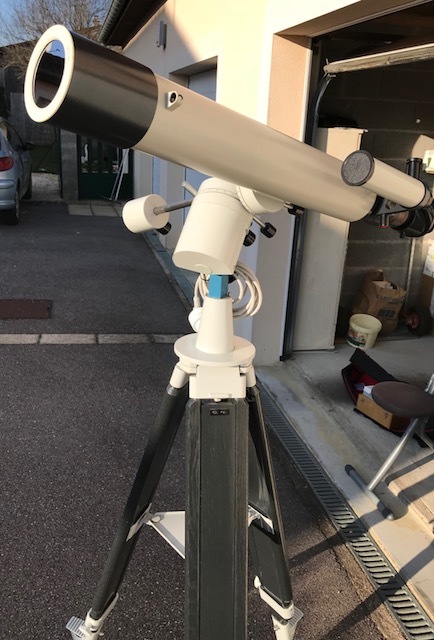 I only know of an another French astronomer who has one. indeed the serial number starts with 95, maybe the year of production ? No, we were not allowed to bring cameras inside the optical factory. Do you remember how many Meniskas 180 and Telementor/Telemator you saw when you were visiting? There were several of both and I was on the brinck of getting hold of a Meniskas 180 in GDR mark. That was about a quarter of the price. But the Treuhand managed to cancel my order. I guess there most have been at least 100 Telemators in that store room, ready packed. When the wall came crumbling down some well known individuals managed to buy the whole production line for next to nothing. You can still find n.o.s. from that time being offered online. I read somewhere that 63mm scopes by Zeiss were produced by a stunning number of 10.000 pcs in total, or something like that... can that be true ? I can’t figure out how many AS80/840 got produced (complete ones, not cells only). I guess that number is correct. In addition to sales overseas, the Telementor was installed in almost every school in GDR. The same were microscopes. It was a part of the education program in GDR. Nobody has a leaflet, user manual, ads or whatever about my AS80/840? 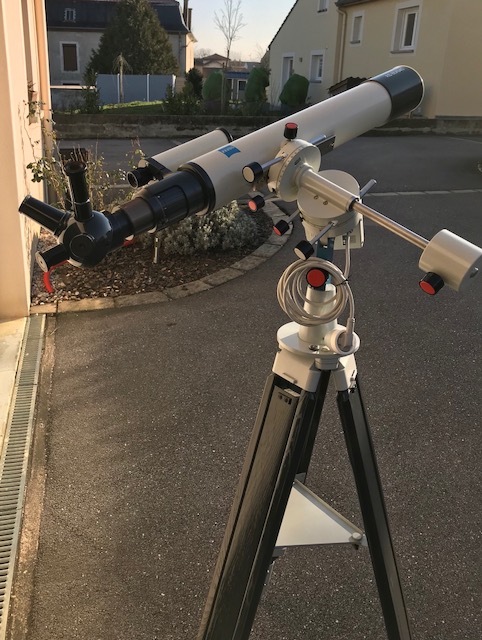 Did you check out the telescope wiki? It has several late catalogues of the entire line.